I think the first thing I’d say to a random Christian asking me about Calvinism or Arminianism, would go something like, “I think I know what I mean by those terms, but what do you mean when you use them?” In my experience people often have a very unsavory connotation of whichever side they do not espouse to the extent that the other position becomes a caricature that proponents do not hold themselves. However, if what you describe in your Teaching Doctrinal Statement is what you believe Calvinism to be, I’m totally on board. . .
One of the things that caused me to appreciate this church was not just their theological precision but their humility. Members who joined the church did not have to embrace, or even understand, this thing called Calvinism. It was only the Bible teachers, staff, and elders who needed to agree to teach in concert with the doctrinal statement. And yet, they cared enough to take the time to write everything out so that prospective members (and prospective staff pastors) could know what they were getting into when they joined. Well, I’m rambling a bit, but this combination of theological precision and humble posture do not go together as often as they should. This is one reason I liked J.A. 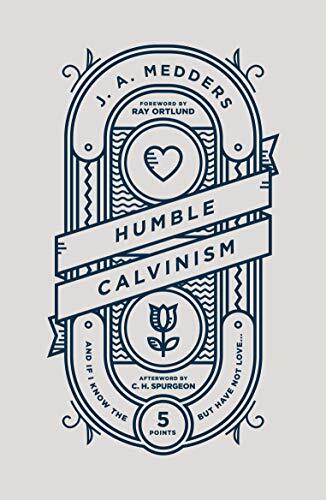 Medder’s new book, Humble Calvinism: If I Know the Five Points, but Have Not Love . . . Medders is a pastor in Texas at Redeemer Church. He’s also the author of Gospel Formed and co-author of Rooted. If his name sounds familiar to readers of this blog, perhaps it’s because I’ve written about him a few times. He’s one of the twelve contributors to my recent book Don’t Just Send a Resume, and he hosts Home Row, one of my favorite podcasts about writing. “We don’t need less Calvinism,” Medder’s writes early in the book, “we need more real Calvinism” (p. 27). I agree. Calvinism, which holds to a high view of God’s sovereignty, especially in salvation, ought to produce the most humble of Christians. You can’t rightly claim you were a wretch when God did everything necessary to save you while simultaneously having a boastful smirk and a cocky swagger. It sometimes does happen, but it shouldn’t happen. In fact, I’m sure several people reading this post have been hurt by Christians who espoused Calvinism but did so with such arrogance that you’ve been turned off the topic ever since. “Many of us who claim to love the ‘doctrines of grace,’” Medders writes, “have not grown in showing grace. We have not become more gracious, kind, tender, and compassionate. And that can only mean one thing: we actually don’t know the doctrines of grace” (p. 17). But others reading this review might be thinking, “Wait—I don’t really know what Calvinism is. Neither do I know the ‘five points’ mentioned in the subtitle.” To this, I’ll say that Medders does of faithful job of bringing readers up to speed. After the introduction there is a short section that covers historical background and definition of terms. In the rest of the book, Medders unpacks each of the five points of Calvinism (often identified by the acronym TULIP) and how each point should produce meek not malicious Christians. As someone who has read a number of books on this topic, let me also say how enjoyable Medders made his book, which is not easy to do when explaining theology; his sentences snap, crackle, and pop. For example, he writes of those who wield their Calvinism like a lead pipe; getting his first whiff of TULIP; making theological taxidermy a hobby; and predestination as the prequel of our faith in Christ (pp. 19, 43, 45, and 77). Humble Calvinism is a helpful book for those trying for the first time to understand the Calvinistic view of God’s sovereignty in salvation. And it’s also a convicting book for pastors like me who need to be reminded that if our understanding of Calvinism—or any other doctrine—produces in us arrogance, then we haven’t learned the doctrine as we ought.